Imitation shark fin soup is a very popular snack sold by street hawkers in Hong Kong. Why? Now you can make this delicious street food at home. In Chinese wedding banquet, guests can enjoy 8 to 10 expensive dishes. It would definitely include a shark fin soup. Not only does this soup take a long time to cook, but also is shark fin tremendously expensive. That’s why this soup won’t be on a family’s daily menu. Yet many Chinese like this soup very much. According to Wikipedia in Chinese, many hawkers started selling this soup on street many years ago. Initially they sold genuine shark fin soup in early days as they could buy broken parts of shark fins from restaurants. Then they cooked shark fins with dried black fungus, egg and water chestnut flour. It’s widely accepted by Hong Kong people. The soup was sold in little bowls. So it’s called 碗仔翅 in Chinese Cantonese (literally translated into English that is “Shark Fin Soup in Little Bowls”). Nowadays, the hawkers use cellophane noodles instead of genuine shark fin simply because no restaurants would do so anymore as the price of shark fins has been growing up. Thus, Imitation Shark Fin Soup has come into place. People still love this imitated version, as it tastes delicious, not expensive and easy to prepare. 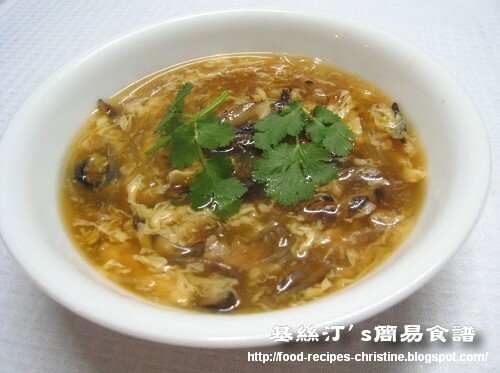 Soak black mushrooms, dried black fungus and cellophane noodles separately until soften and drain well. Remove the hard stems of black mushrooms (you can save the stems to cook other Chinese soups if you like), cut into small strips. Trim the dried black fungus. Section cellophane noodles. Set aside. Shred chicken breast and pork into thin strips. Bring chicken broth and water to the boil. Add chicken, pork, black mushroom, dried black fungus and cook for a while until all ingredients are cooked through and softened. Add cellophane noodles and seasoning. Add salt to taste. When it boils again, stir in thickening and beaten egg, mix well. Remove from heat. Use a small bowl to serve! I received an email from a reader to request this recipe in English that originally posted on my Chinese food blog. Well, I have to admit this recipe is a must to post and share with those who love Hong Kong street snacks. mmmm...this looks delicious. I don't think anyone will miss the shark. I love your website because it's in ENGLISH!!!! pardon me, i'm not much of a cook but when you say shred chicken breast or pork, you cook the meat first then shred or shred them while raw? Just shred the raw meat. When the soup boils, cook them through in the soup, very convenient. Great recipe. Instead of using cellophane noodles, I used vegetarian sharks fin. It is much more realistic to sharks fin and gives it that texture without having to kill a shark for the fin. Hi there. I would like to know if I can substitute chestnut flour with regular flour or starch? And if I use salted chicken broth I don't need to add salt right? Thanks. The water chestnut flour is the best for cooking this soup because it creates a clear, crystal soup. You still can use other starch though. Yes, if salted chicken broth is used, decrease or omit the salt then. Sometimes I cook chicken broth, but sometimes I just use the ready made chicken stock in boxes, very handy. Sorry, stupid question here. Can I use the western style chicken stock bought from Woolsworth? Or must it be the Chinese style from Asian shops? Either kind of chicken stock would do. But for this recipe, I, myself, incline to use the Chinese one, Swanson Chicken Broth （史雲生清雞湯）. Thanks a lot for sharing your recipes in English, I will definitely try this one. Where is the substitute for the shark fin? I would like to suggest dark yam cake sliced thinly. It has the appearance and texture of shark fin. It's available in oriental groceries. Using cellophane noodles as an imitation and substitute for the shark fin is a traditional way of cooking this dish by Hong Kong hawkers. Whenever I spot any shark fin melons available at grocers, I would cook the soup. You just cut the melon into pieces and steam them until cooked through, scrape out the fin-like pulps to make soup. Very easy. I posted the recipe on my Chinese food blog here. Sorry, haven't translated it yet. About 2 to 3 people. Depends on how hungry they are. having friends over for dinner this weekend. Can I make this one day ahead? Thank you! Might cook the soup base ahead, leaving the cellophane noodles, egg and thickening out. Add them when you boil it again. It's much better, I think. Shark fin melon? In U.S. we call it spaghetti squash. I would never have thought to substitute it for shark fin! Good thinking. You can try Shark fin melon, 魚翅瓜 in Chinese. I often use cellophane noodles（粉絲) when making this soup.